US presidential candidate Donald Trump turns 70 today. 'Barely' 14,000 kilometres away, in India, his supporters who consider him a 'saviour' have already prepared for his birthday bash. The Hindu Sena, a right-wing group, has planned the birthday celebration at Jantar Mantar in New Delhi. There will be cake, music and orchestra for the occasion, say the organisers. The Sena feels that Trump would wipe out 'Islamic terror' from the earth. The group's national president Vishnu Gupta had earlier organised a 'hawan' [special prayers] too in Delhi for Trump's victory. 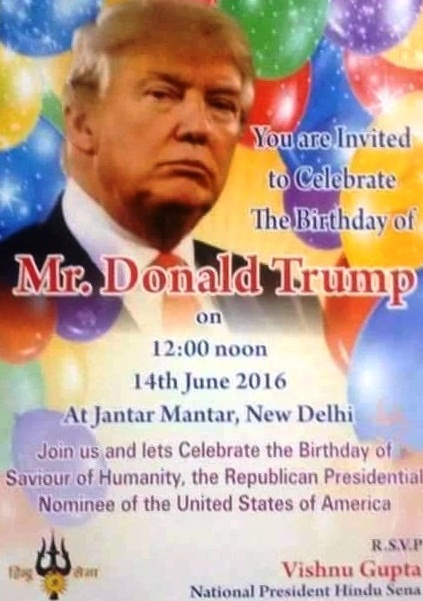 The poster calls people to attend the birthday of a 'Saviour of Humanity', the Republican presidential nominee of the United States of America. The controversial Hindu Sena leader has been booked in the past for assault and vandalism. The Sena also has plans to give arms' training to youths to fight Islamic terrorism. The Sena feels that Hillary Clinton is secular while Trump is not, hence, they support him. They feel his election would change the global politics and would check the Islamists. 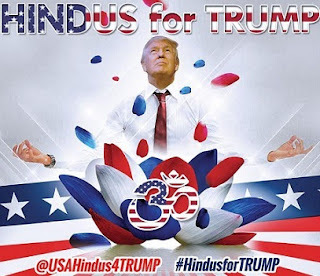 Interestingly, Trump hasn't been pro-Indian, however, his campaign has found support from NRI Hindus too. In United States too, there has been a 'Hindus for Trump' campaign. The image is here on the right. The campaigners who are active on social media too, had released a controversial poster that showed Donald J Trump as a divine personality.